Crowds filled the streets around Windsor Castle on Friday. Crowds filled the streets around Windsor Castle on Friday one day before Meghan Markle and Prince Harry's wedding. Many wrapped themselves in flags while others accessorized with tiaras and Meghan and Harry masks. Some even prepared themselves for a cold night of camping outside to secure a good view of the royal couple after Saturday's ceremony at St George's Chapel in Windsor Castle. (Lena Masri/ABC News) Jeanette Valentine and her boyfriend Patrick McKemie from California camped outside Windsor Castle on May 18, the day before the royal wedding. Jeanette Valentine's birthday is on May 19, the same day as the royal wedding, and her boyfriend Patrick McKemie gave her plane tickets to England as a present. 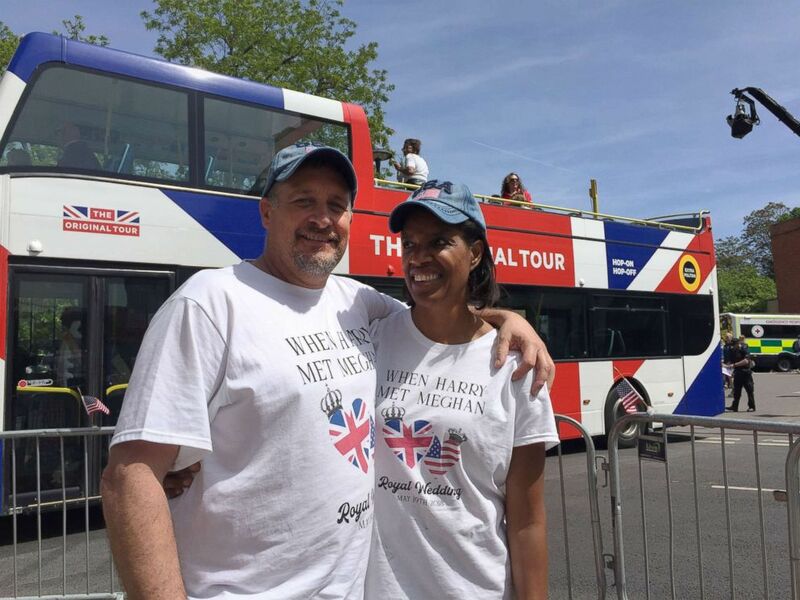 The couple from San Francisco landed on Thursday and showed up at Windsor wearing "When Harry Met Meghan" T-shirts Friday morning. "We're only here for 72 hours specifically to watch Meghan and Harry go by in 10 seconds," Valentine told ABC News. Like Markle, she graduated from Northwestern University, but that's not all the two have in common. (Lena Masri/ABC News) Judith Hunt and her 8-year-old granddaughter Luna prepare to sleep outside Windsor Castle on May 18, one day before the royal wedding between Meghan Markle and Prince Harry. "They're an interracial couple just like us," she said. "I think it's really important for the world to see that someone who doesn't look like all of the royals has captured the heart of Prince Harry," she added. "It's that much more special to me because she's half African-American. She's a black princess. You know, little black girls all over the country, all over the United States, are going to look at her and think, 'Wow, I can do that too. I can be a black princess.'" For Judith Hunt, visiting the U.K. for royal weddings has become a tradition. 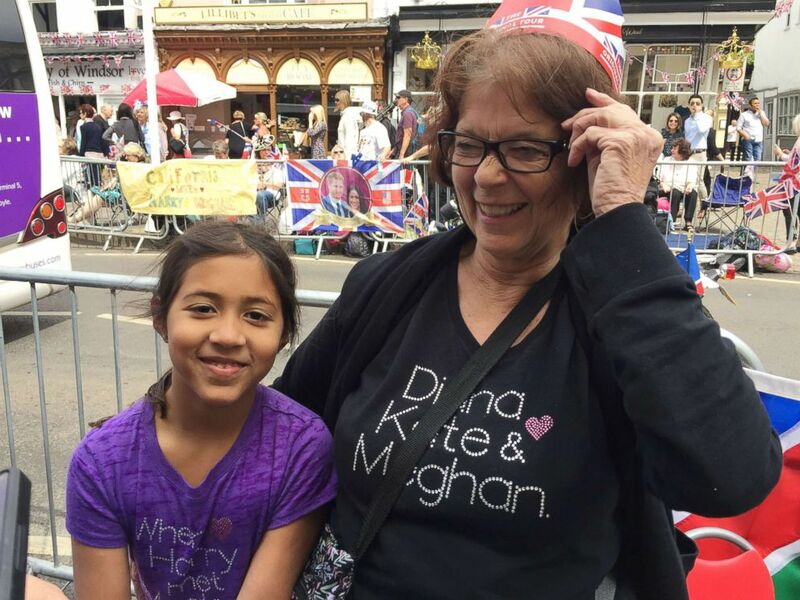 She traveled from New Jersey with her 8-year-old granddaughter Luna, and the two plan to spend the night outside Windsor Castle. 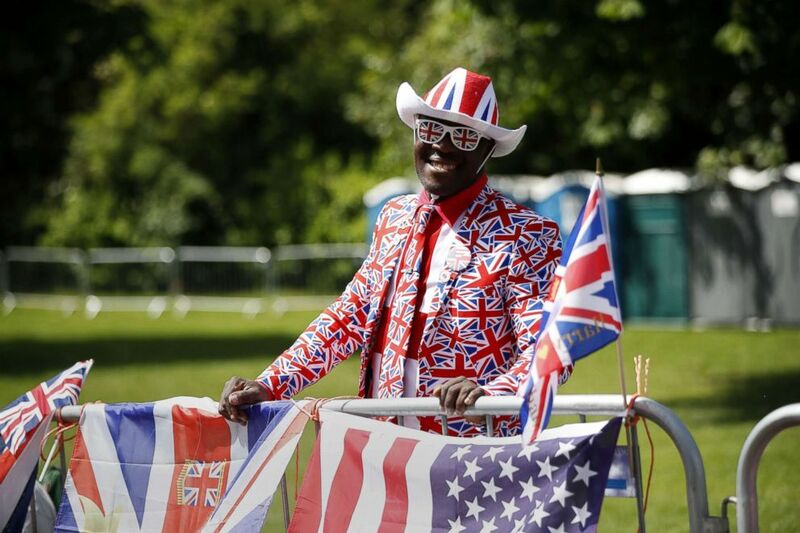 (Tolga Akmen/AFP/Getty Images) Royal fan Joseph Afrane, bedecked in a Union flag pattern, poses along the Long Walk in Windsor on May 18, 2018, the day before the Royal wedding. On Saturday, some 100,000 people are expected to fill the streets around Windsor Castle for the royal wedding. After the wedding ceremony, which starts at noon local time, the newlyweds will take a carriage ride through the streets of Windsor.